West Conshohocken municipal offices are located at 112 Ford Street, West Conshohocken PA 19428; phone: 610-828-9747. Public School students attend the Upper Merion Area School District. The Borough was incorporated in 1874. It is slightly less than 1 square mile. The borough operates a public park that has a playground, basketball courts, and athletic fields. Although the median age of Borough residences is circa 1955, the majority were built either circa 1870-1920 and circa 1994-2001. Newer homes are found on Campbell Dr, Spring Garden Lane, Riverview Ln, Spruce Ln, and Merion Hill Ln. Early residences are found on Bullock St, Josephine Ave, Cedar Ave, Merion Ave, Front St and Ford St. In the Treaty of 1683 William Penn was given a piece of land - later to be known as West Conshohocken - by the Unami Tribe of the Lenni-Lenape nation of Indians. The name Conshohocken, found on William Penn's deed, is a derivative of "Gueno-dkeiki-hacking ... the place of the long fine land," as it was described by the Lenni-Lenape Indians. Today, Conshohocken is interpreted as "Pleasant Valley". 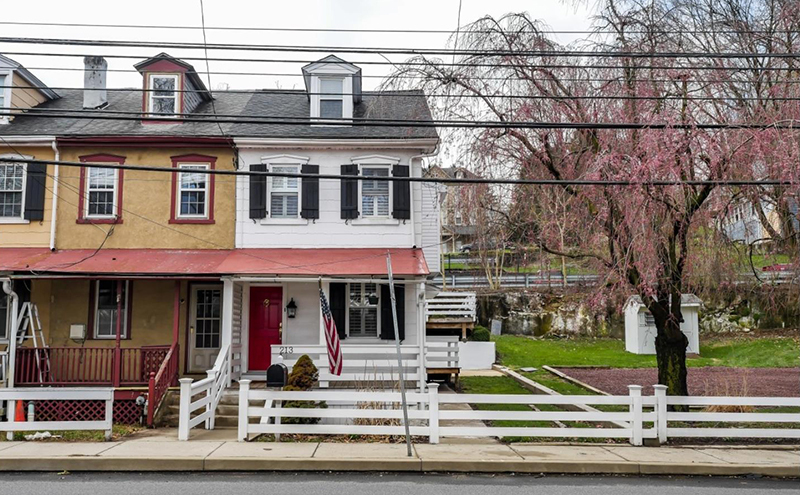 In 1712, John Matson, an early settler, acquired land from William Penn that included the west bank of the Schuylkill from the present-day Bridgeport to the Lower Merion Township Line. Peter Matson, John Matson's son built his house along the river and installed a "ford" by placing rocks in the river. That community became known as Matson's Ford, a name that still endures today as a street in town. Matson's Ford played a small part in history during the Revolutionary War. In 1777, Washington's army left Whitemarsh and traveled down Conshohocken's Fayette Street towards Matson's Ford. They constructed a bridge of wagons, over which rails were laid as the soldiers crossed under the command of Lafayette. As they were coming over, Lord Cornwallis and his British soldiers appeared from the hills. Our soldiers were forced to retreat and cross Swede's Ford into Valley Forge on December 13, 1777. The first Council of the Borough started in October 6, 1847. It dealt with various problems such as "preventing horse, mule, cow, bull or other cattle, swine or goats to run at large in the streets of said borough. The fine of not less that one dollar nor more than five dollars will be imposed." In the years to come, Council made regulations to traffic by way of one-way streets and parking regulations. Council also levied a tax on such services as telephone, electric light, heat and power. One of the earliest forms of mass transportation in West Conshohocken was the Reading Railroad, built in 1839. The service reached from Reading to Pottstown and down the West Bank of the Schuylkill to West Conshohocken. Bus service began in the 1920's. One of the Borough's main concerns beginning back to the 18th century and continuing to the present day were traffic and roadways. "From Township Line Road in the eighteenth century to the Schuylkill Expressway and the controversial Blue Route in the twentieth century, roads leading to West Conshohocken have been of concern to the whole (Montgomery) county." The first bridge connecting West Conshohocken with its neighboring land, Conshohocken was a wooden bridge in 1866. This bridge was later replaced by an iron bridge build in 1972. The cost of walking over the bridge was one cent. Driving across the bridge with two horses cost twelve and a half cents each way. In 1921, the iron bridge was replaced by a concrete bridge. This bridge was later replaced in the 1980's with a new and improved bridge heavily used today. Read more about the history of our bridges. West Conshohocken's major traffic artery is the Schuylkill Expressway, which formally opened to traffic at 9:00 AM on December 8, 1952. Borough officials and State Highway Department engineers participated in a brief ribbon-cutting ceremony. Another important highway is the Blue Route. In 1981 three miles were finished, extending from Ridge Pike in Plymouth Township to the Schuylkill Expressway, relieving traffic between West Conshohocken and Conshohocken, which had reached 38,000 vehicles per day. Today, the Blue Route extends from the Northeast Turnpike to the Philadelphia National Airport - a big improvement in the past 21 years. The first fire company was established in West Conshohocken in 1898 through a proposal from John Clay of Philadelphia to provide the Borough with a hose carriage built for $800 with the following provisions: the town would build a suitable building costing no more than $1,500 and to name the company after his brother George. Hence, the name exists today, the George Clay Fire Company of West Conshohocken. On January 27, 1971, at 9:45 PM, the most disastrous fire to ever hit the borough resulted from a gas explosion on Front Street with flames ranging 100 feet in the air. Fifteen houses were destroyed and twenty-five others were damaged. Fifty people were injured and taken to nearby hospitals. Five people were killed, including Joseph Powers, a nineteen-year-old fireman. Read more about the 1971 fire. The earliest forms of business from the town of West Conshohocken were large textile mills operating along the Schuylkill, producing woolen cloth for federal government and army uniforms up to and including World War II. There was also a stone company, a gas company and a cement company. Soon industrial parks sprouted up with manufacturing, printing and color processing companies.